Three-Player Air Hockey | OhGizmo! No longer will that third-wheel have to stand by and keep score while you and your friend enjoy a rousing game of air hockey. Brookstone’s three-player air hockey clearly bends time and space to allow a single table to facilitate three players at one time. And when that third-wheel finally gets the hint and heads home the three-player table can be easily converted to a two-player version with the addition of a bar that blocks the third wing. 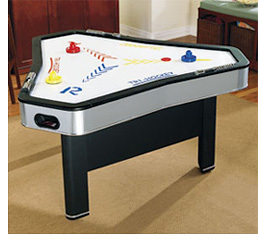 The three-player air hockey table is available from Brookstone for $599.95 plus an extra $100 for shipping.